Nearest and dearest didn’t look too thrilled at my suggestion that we go down Cinder Lane to look at the Engineers’ Triangle and some rusty old shovels. 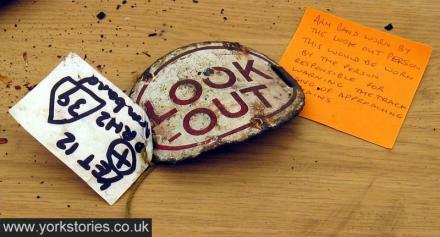 Actually I didn’t mention the rusty old shovels, as details were unknown until today. It appears that at least one of the roundhouses was demolished as recently as the 1960s and that there are plenty of people who remember them. The site has been opened to the public today and tomorrow (27th and 28th April). There were three of these structures, buildings once, now just foundations/patterns of brick and stone, their shape perhaps clearest from an aerial view, but I didn’t have a plane to hand. Best to focus perhaps on the interesting details in the exhibition tent. 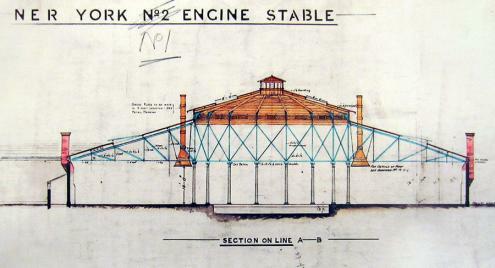 Including this handsome plan/drawing, presumably of the original structures, titled ‘YORK ENGINE STABLE’. 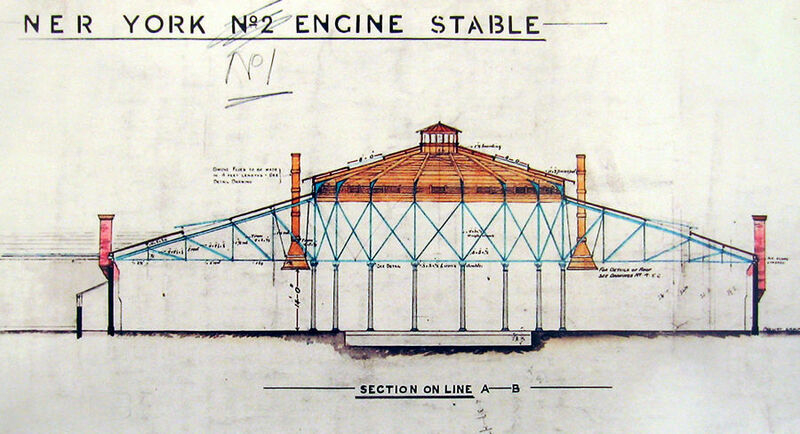 Which reminds me that we called the locomotive an ‘iron horse’ – it too needed its ’stable’. There wasn’t a caption on the photo above, so I’m not sure if it’s a record of one of the roundhouses here, or a roundhouse, elsewhere. Lovely though, isn’t it. The display included the plans for the site’s development, and a sizeable collection of artefacts discovered on site during the recent excavation. Including the rusty old shovels mentioned above. My photos of shovels weren’t particularly impressive, so instead here’s a photo of a rusty old sign. I love the idea of some unknown, anonymous workman chucking an old shovel in a corner and it now being displayed with a label attached, as part of an exhibition. Would he be laughing at me studiously studying these rusty bits of metal? Probably. I thought of my great-great-great grandfather, working on the Permanent Way when the railways first cut their way through from York to Scarborough, and my great-grandfather who arrived, via that railway system, here in York as a railway porter, working on York station, a stone’s throw away. And all the other ordinary blokes doing their work, keeping things running. Nice that visitors were encouraged to add explanatory notes to the assembled objects, some of which hadn’t been identified as yet. It wasn’t clear which were visitor contributions – all of them? – on post-it notes. I couldn’t add anything, having no useful knowledge. I recognised a brick. Adding a post-it saying ‘this is an old brick’ didn’t seem like a useful contribution. This note above, on the other hand, offered interesting information (can be enlarged, as can the others). 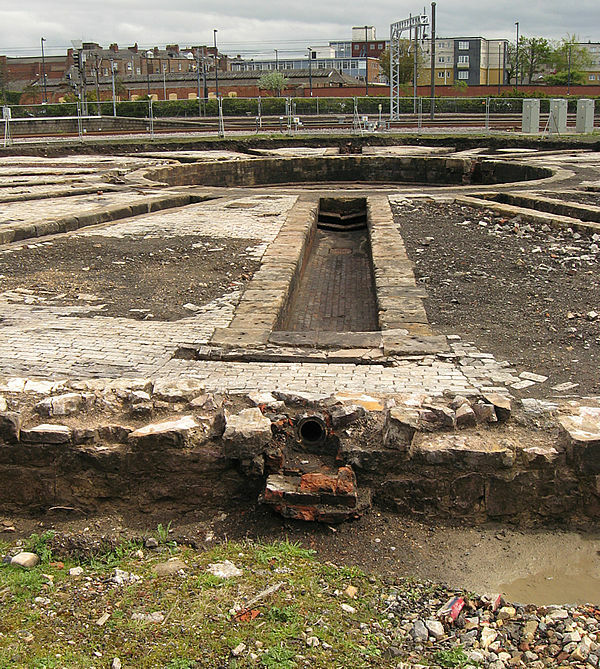 There are more photos from the site in my set on flickr.com – York South (Engineers’ Triangle). There’s a clear map of the location of the Engineers’ Triangle (also known as York South) on the Rail UK site, plus a photo of the buildings before demolition, and more info on the buildings at the Loco Sheds site. 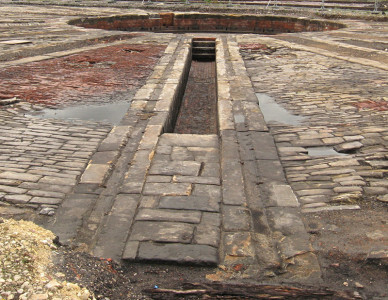 By Lisa @YorkStories • 27 April 2012 Rail, roads, rivers, Railways To link to this page's proper location please use the > permalink. Came across this photo whilst looking for something else (often the case). Thanks David, isn’t that a great aerial view – including the roundhouses at bottom right. The two remaining ones which were demolished not long after this was taken. 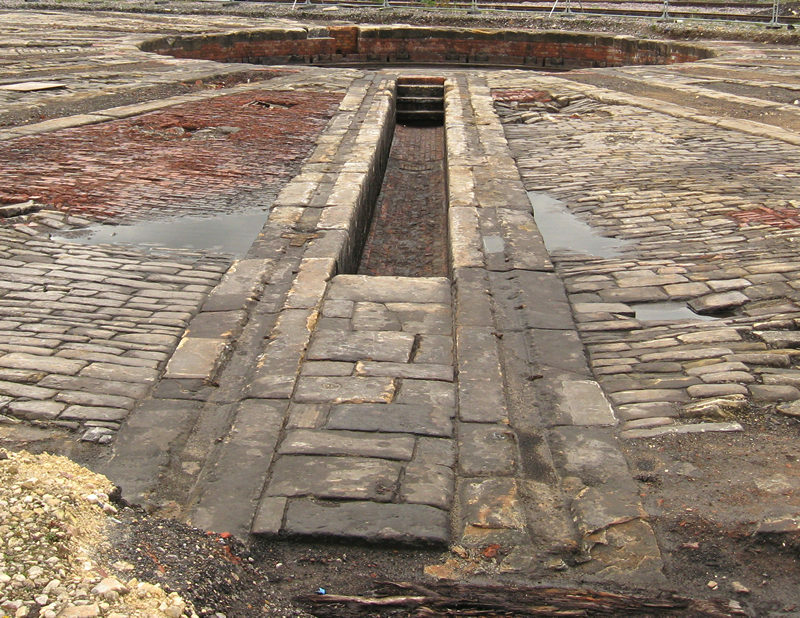 As an aside, it’s irritating and quite shocking that the necessary funding and expertise hasn’t been found to update and upgrade http://www.imagineyork.co.uk, where you found this photo and others. It would appear to be impossible to link to the photo with a caption included, so the photos are adrift from their accompanying info. So much effort and time clearly went into compiling this resource, which appears to have been forgotten. Makes me wonder if the same will happen to the council’s ‘York Stories’ project. Perhaps putting effort into better presentation of these ‘York Stories’ would have been more helpful. Alternatively, go to http://www.imagineyork.co.uk, go through the weird clunky double-entry entry to the extremely dated interface, and enter the search term ‘railway aerial view’, for this and some other interesting photos. I agree, Imagine York is a good resource but difficult to navigate. You can’t even hit the “back button” without an error message. And whilst the majority of the narrative is correct, there are a few things that aren’t quite right. So as far as the competing website goes you have nothing to worry about, but then I always knew that would be the case anyway. Had another look at the other York Stories site and, since I first viewed, they have added a switch to a more basic site to make it more accessible/usable. But, like I say, even before it launched I had a feeling it wouldn’t be as attractive as your own site, despite all the council funding and the confident design team. At the bottom line, it exists because York800 is rather vainglorious and people have been paid public money to produce the York Stories 2012 website as part of that. I don’t think there was any malice intended in selecting the name, but there wasn’t any consideration for you either, and they could easily have found a different name if they had been a bit more mindful. At least the whole thing is time barred. Thank you David, for your support of this website. The ‘York Stories Turf Wars 2012′ (as I like to call the situation, in jest) have certainly been interesting. I should have added that I have nothing against anyone who submits a story on the council website as they are doing so in good faith and if anything it would be nice to see more of them. And I suppose that York Stories is just a play on words of “Your Stories” and so the choice of name is understandable. 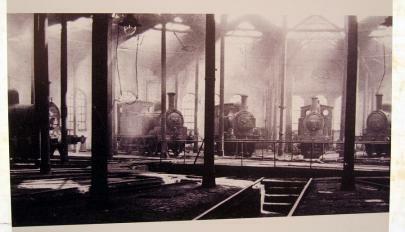 Hi, the photograph you are unsure about is the interior of the larger 1864 North Eastern Railway roundhouse, designed by NER architect Thomas Prosser (who also designed the current York Station in 1871 (its construction was finished in 1877)), and taken in 1952 when it was used for stabling station pilot engines. The roof has been damaged by bombing and then general neglect, and as you know from the aerial shots it was removed shortly afterwards. If you were there on the Friday, I was one of the two people running around on the roundhouse remains, shouting myself hoarse over the sound of passing trains. Thanks Ed, for clarifying this. I’ve added a note by the relevant photo above. I think I missed you running around the roundhouses! It was really good being able to see it all, thanks to everyone involved in the open days. Engine shed rooves were always in poor shape because the mixture of steam and coal fire flue gases is highly corrosive and wooden rooves had to be replaced regularly. 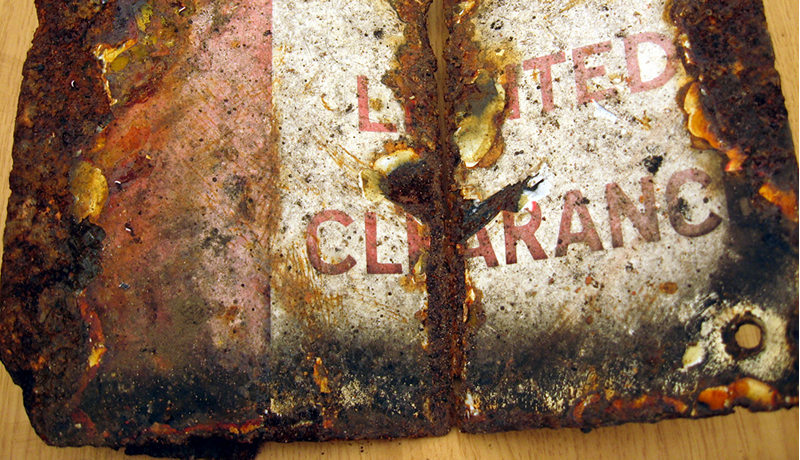 In the late fifties with the end of steam in mind BR stopped maintaining the buildings (in general, not just York south) and so many lost their roof like this. As your Great Grandfather was a Porter on York station, there’s a fair chance he knew my Grandfather who was also a porter in the 1920’s – 1940’s. His surname was Horsley. When clearing some old tins full of buttons last month at my late mum’s home, I discovered his old uniform buttons from GNER days and dutifully took them to The National Rail Museum who told me that they didn’t want them and they would be thrown away. It’s a sad day when a National Heritage centre discards our National Heritage.